Above: Greg Hadjian blasts the city for planning to eliminate parking and encourage more traffic through a street in historic Fells Point. 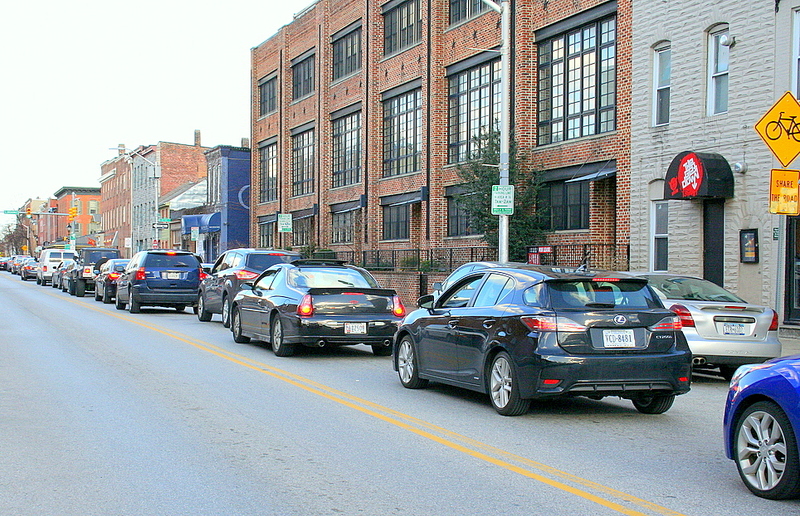 Poised to denounce the city’s plan to speed traffic through Fells Point by taking a parking lane away from Aliceanna Street at rush hour, residents were surprised last night to find that the idea had been scaled back. What was once going to be a wider Aliceanna in the late afternoon stretching from Harbor East to Boston Street was now, Department of Transportation officials said, only going to consist of a 4-7 p.m. south-side parking restriction on the single block between Washington and Chester streets. First District Councilman James B. Kraft had told residents and the media last month that the bigger plan was “a done deal,” saying he’d known about it for months but hadn’t informed residents because DOT told him it was unstoppable and taking effect in April. 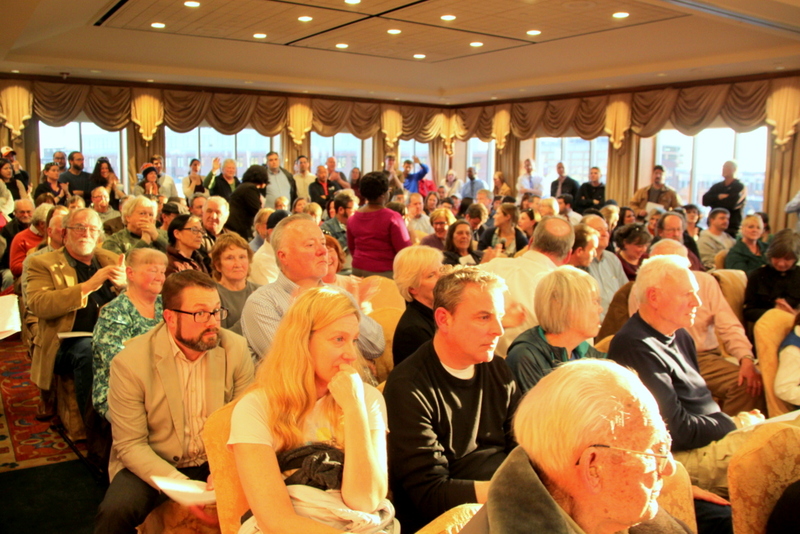 Now speaking before a packed meeting room at the Admiral Fell Inn – with protesters outside holding signs that read “Save Our Streets” and “The commuters are coming!” – DOT senior advisor Frank Murphy was saying that his agency had been talking about a number of “possible” scenarios to deal with traffic congestion, and that the resulting “informal” plan was subject to public review. Then how had Kraft gotten the idea the bigger plan had, without community input, become set in stone, business owner Nick Johnson wanted to know. “It was a misunderstanding with our staff,” said Sameer Sidh, DOT’s chief of special projects and business improvement, setting off a ripple of guffaws in the room. “I understand the laughter,” Sidh said, facing the crowd of more than 250 people. 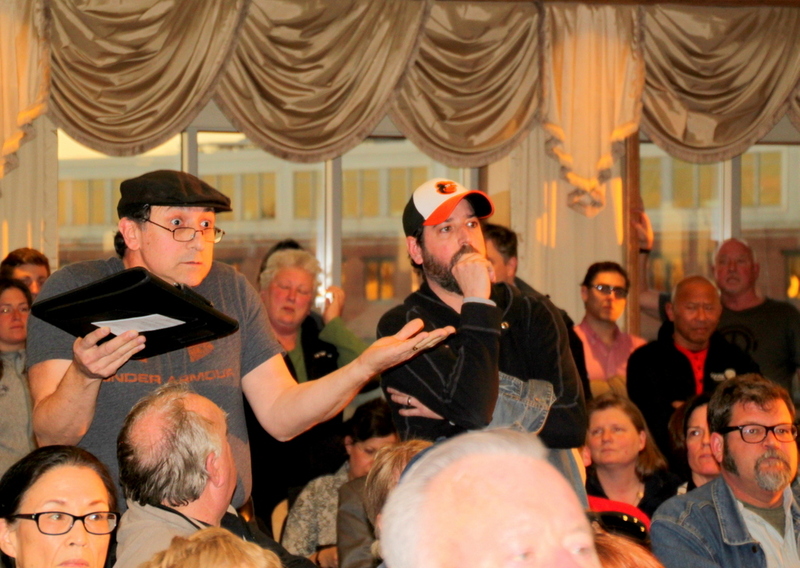 “Right now, you don’t have credibility,” resident Andrew Hall bluntly told Murphy. There was more derisive laughter when Kraft came up to the microphone, urging citizens to stop focusing on the process and consider the current plan. “I don’t think it’s the time to throw anybody under the bus,” the councilman said, perhaps choosing a poor metaphor considering the larger issue driving the crowd’s anger. Heavy traffic and poorly-timed traffic lights can be found “on every street,” said Ronnie Pasztor, owner of Sticky Rice restaurant. Pasztor said when riding his bike with his eight-year-old daughter he often has to ride, illegally, on the sidewalk because the streets are too dangerous. “I’ll take that ticket,” said Pasztor, who warned that worsening traffic congestion will drive people like him out of a reviving area. Booming development and traffic in Southeast Baltimore and the city’s failure to plan for it was the theme for speaker after speaker. “We have this incredible traffic situation and we’re going to take the parking away and that’s going to fix it?” Christy Wolfe, of Fells Point, said. • A double right-turn lane to be installed on eastbound Aliceanna Street at Boston Street. • The existing left turn lane on westbound Aliceanna Street near Boston Street (entering the adjacent Captain James parking lot just west of Boston Street) would be removed. Several residents, holding copies of the Southeast Baltimore Transportation Action Plan, asked why its recommendations (including traffic calming measures on Aliceanna) had not been implemented. Some improvements had been completed or had begun, Murphy replied. The public can comment on the latest Aliceanna proposal for a one-month period, ending on April 30, DOT officials said. At a date to be determined in June, there will be “a public meeting on findings,” according to a city handout. Comments can be made to the DOT’s Grishae Blackette at 443-984-4095/4094 or Grishae.Blackette@baltimorecity.gov. “Get ready for what’s coming to your in-box, Grishae,” someone called out to Blackette. She got a taste of it during the two-hour meeting. 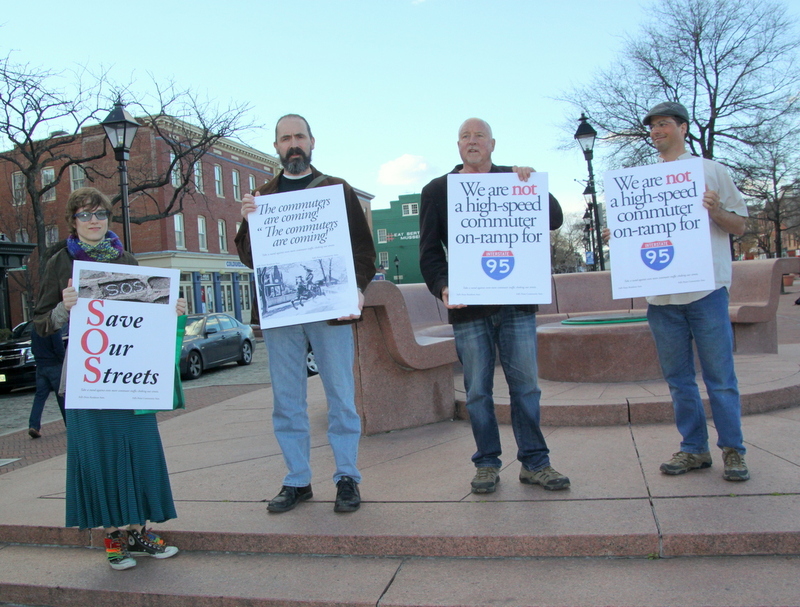 The Action Plan calls for Aliceanna to get a traffic calming makeover “and this ain’t it,” said Greg Hinchliffe, executive director of the advocacy group Bikemore. “Joe Camaro, going 2 miles an hour” before the widened block will “floor it” and “do 50 miles an hour” to try to make the green light at Boston Street, said Hinchliffe. Pedestrians also feel unsafe and fear crossing the streets, many speakers told DOT. “I can’t let my kid or my dog outside, Joe Collins, of Montford, complained. “We are opposed to a high-speed road going through Fells Point,” said New Century School executive director Alicia Danyali, noting that “you have a lot of families strolling” near the South Ann Street school. Many speakers said the rumbling truck traffic on Aliceanna shakes houses, some dating back two centuries and, according to restaurateur Nancy Longo, built on reclaimed land. “That street is built on oyster shells,” said Longo, who said the rumbling traffic has caused her building on Aliceanna to sink and that the road there floods whenever there’s a rain. The subsurface “is like Jell-o”‘ agreed Denise Whitman, who said her 200-plus-year-old house shakes every time a truck goes by. Several speakers who said they like to walk or ride bikes said they felt bad about adding to the congestion by circling the block in search of parking when they come home from work. Barry Glassman, of neighboring Butcher’s Hill, said he worries that allowing the one-block change on Aliceanna would give the city “a foot in the door,” that would allow them to go further. Her group “didn’t just whine and complain,” she said, but came up with a long list of priority issues and suggested solutions. Among them were: hanging DON’T BLOCK THE BOX signs FINE $250 at each intersection, instituting a commuter tax and banning truck traffic on Aliceanna between 4 pm and 7 pm. “It was a really well-put-together plan,” Masopust said, turning to Murphy and smiling. Removing the asphalt and taking Aliceanna down to the original Belgian block got what may have been the biggest applause of the evening. 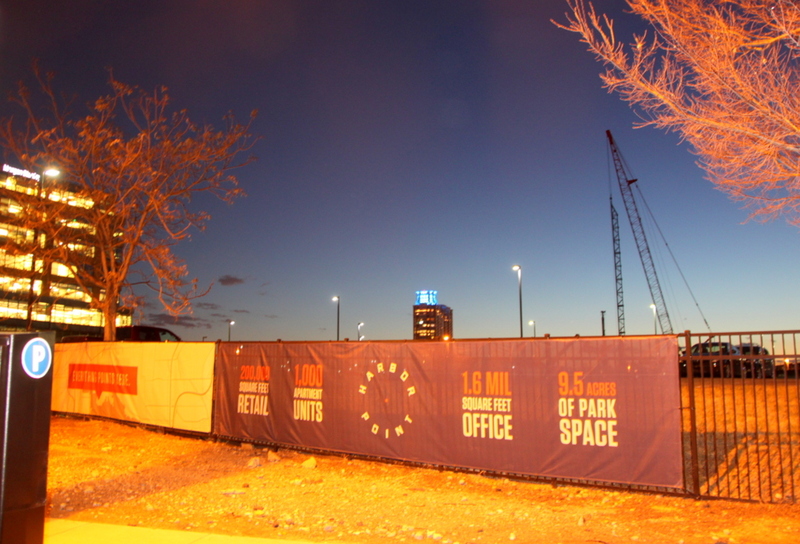 Speakers arguing that runaway development is driving the problem gestured repeatedly to the window where the towers of Harbor East and Harbor Point, along with a construction crane, were silhouetted against a setting sun. Laura Gamble said to take their message back to City Hall.